Checking, logging, and analyzing event triggers and data is paramount to bridging data and systems for M2M development and many application developments. In this troubleshooting and analysis, Ubidots Support team ofter hears, "How can I know if my event was triggered? I did not receive any messages." Often the solution is hiding in plain sight for application development and as is true with the Ubidots event Log. Located in the upper-right hand corner of the individual event, user can simply trace the regularity and reliability of their events. 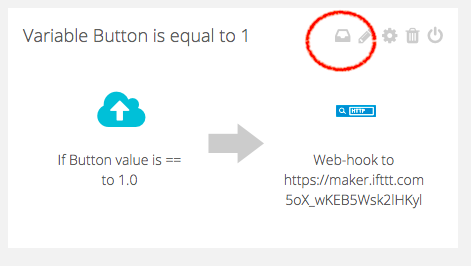 Here if variable == 1 a webhook will be triggered to maker.ifttt.com. In the below two images, we can trace the multiple variable limit of 1 and its corresponding events in the webhook event's Log at 21:28:10 and 21:28:32. Still need help? : If you suspect an event that should have been triggered but was not activated by Ubidots, please reach out to Ubidots support with screenshot evidence stating the event's variable values tables pointing to the value that should have triggered an event and a second screenshot of the event log stating that no such trigger exists. This will greatly help Ubidots Support and Development teams to verify the consistency of the module and isolate any possible anomalies in your situation.